Boneshaker was the effective introduction to the setting. In that, we find out that the American Civil War has been going on for 19 years, rather than the original four. It is 1880 and the country is still divided and fighting, though those young at or born after the start of the war are not necessarily clear as to why. It has become a multigenerational conflict fueling an arms race, among other things. In Boneshaker, the action occurs in Seattle so the war remains largely offstage, really only there by implication and technology, such as the airships. Seattle has been largely abandoned after the accidental release of a gas has turned a large chunk of its populace into rotters (zombies, in other words). The city is walled off and left to, well, rot. In that novel, the story is as much about a mother’s love for her son, our heroine, Briar Wilkes, seeking her son, Zeke, in the city. In Dreadnought, the Civil War moves very much to center stage for much of the book, dominating aspects of the first half of it. Again we have a heroine and she’s another amazingly strong and determined woman. This time is is “Mercy” Lynch, the Southern widow of a Union soldier who has been working as a nurse in Richmond. In a bit of grim storytelling, the grit of this woman, not as a soldier but as someone who has to patch up the wrecks of soldiers, is displayed. We open with her digging through bloody linens for a lost watch for a horribly wounded soldier and doing what needs must as the mangled men to arrive in order to help them survive. From this initial setting, Mercy is required to take a journey, across the country, when she receives word that her father, long thought as either dead or having abandoned his family, sends word that he needs her and may be dying. Mercy sets off with a grim urgency, having no family at all outside of this rather attenuated connection to someone that she hasn’t seen since childhood. 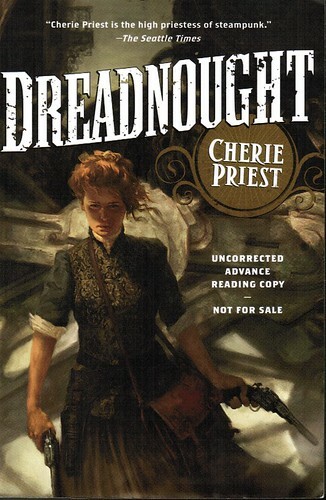 The “Dreadnought” of the title is something encountered along the way. I’m not going to give many spoilers for this book, not wanting to ruin it, but it doesn’t give much away to say it is a train. In fact, it is a Union train that she is compelled to travel on as a Southern woman (if an obvious noncombatant). The most powerful armed and armored train of the Union in a war where, even historically, rail power made the difference between defeat and loss. Along the way, we encounter a tough as nails Texan, reliable and crazed representatives of the Union, Confederate airships and generals, walking and clanking tanks duking it out, and a threat that neither side has really planned for but from which at least one is hoping to profit. We get to see just how driven and determined a nurse can be and, frankly, one of the toughest protagonists, male or female, that I’ve probably read in years. This woman makes most of Clint Eastwood’s characters look rather milquetoast in comparison, especially by the end of the book. The book doesn’t spend long in the Eastern or Southern portions of the country so while we get some idea of how the unending war is affecting society, it isn’t entirely clear since we avoid all but a couple of cities. We do get a sense of the breadth of the continent in a true American fashion as well as just how far it can be from Virginia to Washington on a train that everyone wants to stop where you can’t really trust anyone. In most ways, I found this to be a far better and more compelling novel than Boneshaker. Sure, Boneshaker had frikkin’ zombies running in packs in a walled city, poison gas, underground paranoia, and airships but it just doesn’t hold a candle in pacing and tension to the ongoing knife edge ride of Dreadnought. I do think they are wonderfully complimentary and I do encourage people to read Boneshaker first. I’m very much looking forward to seeing how the rest of the Clockwork Century tails develop (feel free to send me more ARCs!). This is definitely one of the novels to read this fall and one of those that I hope to get my 14 year old daughter to read sooner or later. We need more Briar Wilkes and Mercy Lynches in our steampunk or even just in our fiction. Thank you, Cherie, for that! Go buy this wonderful book in three weeks when it comes out! Heck, pre-order it now! Addendum: I do want to add that I much prefer the original cover of the book, given how small of a role the “walkers” play in the book. I’ve scanned the cover from my ARC so you can see it below. Would you want to mess with this woman or get between her and family? Hell, no!